Early mornings in Bắc Hà, around 800m above sea-level, are often misty and cold. Whatever the weather conditions, the activity starts shortly after dawn at the marketplace. A two minute walk from the town square, Bắc Hà market [MAP] covers a larger area than any other minority market in Vietnam. There are thousands of people and hundreds of stalls. It’s a unique spectacle. The produce is varied, fresh and colourful. The minority women and girls look fantastic in their traditional clothing. The men are just as intriguing: drinking various local liquors, smoking local tobaccos from bamboo pipes, slurping local noodles, and exchanging local gossip. It’s impossible not to be drawn into the vortex of this lively, dazzling Sunday market. But it isn’t just a local market anymore: it’s a tourist market. Now days, trinket and garment kiosks surround the original market stalls. The products – including crockery, scarves, statuettes, and shawls – are very attractive and beautifully made. But, it’s immediately apparent that these kiosks are managed by majority ‘Kinh’ Vietnamese people, not ethnic minorities, and that their customers are tourists, not locals. Calls of ‘You buy something!’ echo around the market, shouted in English every time a foreigner passes by a stall. Brief bargaining takes place between foreign tourists and Vietnamese stall owners. After the sale is made the Vietnamese stall owners shout to each other in Vietnamese, bragging about how much money they fleeced the foreigners for. 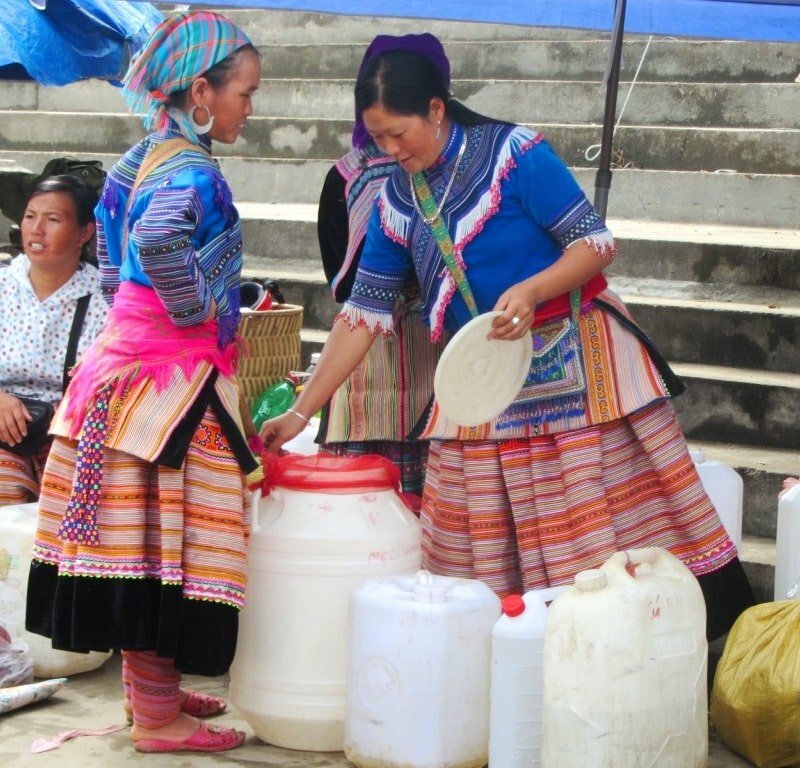 Meanwhile, minority peoples buy and sell the less lucrative produce – meat, fish, vegetables, agricultural appliances, live animals (and a large amount of home-brewed rice wine). 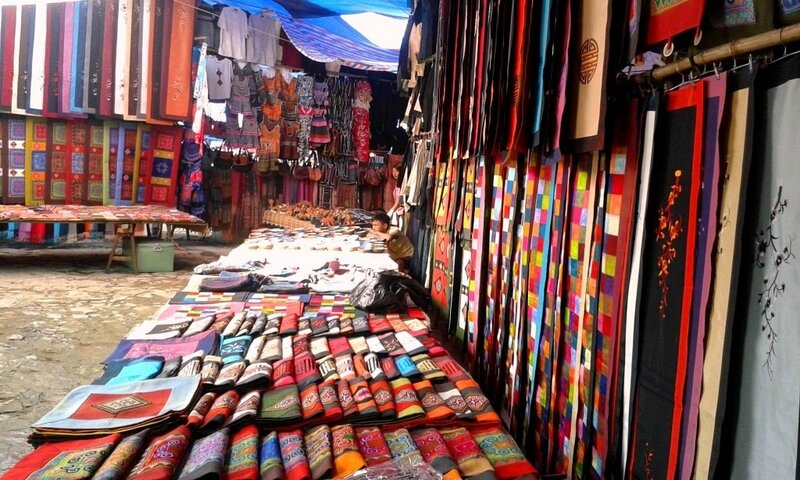 Most tourists don’t find these products as intriguing – and certainly not as attractive – as the garments and other souvenir-suitable items on sale at the Vietnamese ‘Kinh’ stalls. 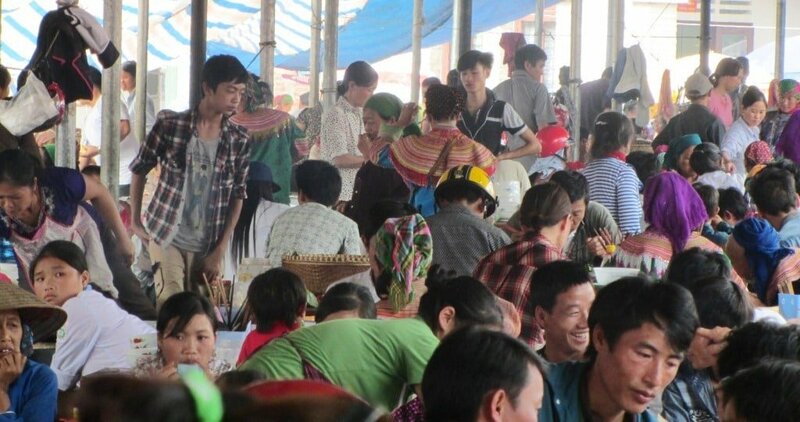 Thus, a large amount of the tourist buck spent at Bắc Hà market fails to make it into minority people’s pockets. 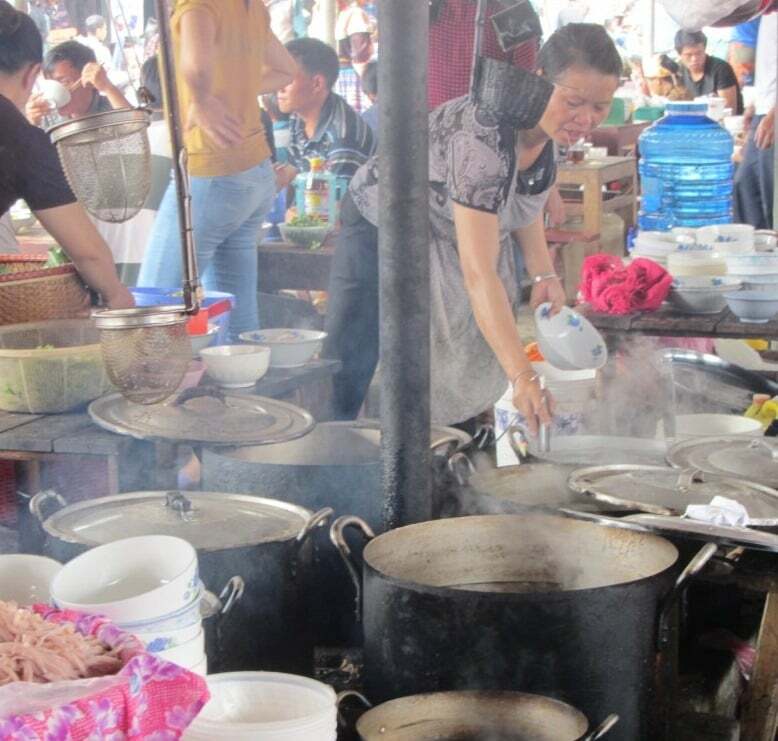 So how do ethnic minorities – who are significantly poorer than Vietnamese ‘Kinh’ – benefit from the massive tourist interest in the Sunday market? Attention, whether wanted or unwanted, seems to be one answer to the above question. On my last visit to the market, a lady from the Flower Hmong, the largest minority group in the area, got angry at me when I stepped too close to her red chillies, which were laid out on the ground. It seemed a disproportionate reaction to me so I made my feelings known to her. As I moved away, another traveller came up and shoved a 10 inch camera lens right into her face, while she made a sale to another Flower Hmong woman. He made no eye contact, no attempt to communicate, not even a smile. He took his pictures and left without buying anything – what tourist is going to buy red chillies at Bac Ha market? After that, I began to notice the big cameras all over the market. Giant lenses pointed right up into minority peoples’ faces, as if they were no more than zoo animals, incapable of feeling self-conscious or offended or that their personal space had been intruded upon. What’s more, there was very little interaction between the photographers and their subjects: no attempt to make them feel at ease or ask if they minded having their picture taken. Perhaps, I thought to myself, there’s a lot to be angry about if you’re a minority woman selling red chillies at Bac Ha market. Bắc Hà Market is a photographer’s dream, but there’s a lack of respect for their subject. By 10am, as busloads of travellers on day trips from Sapa arrive, tourists come close to outnumbering locals. The market begins to feel like a farce, a Disney market, a recreation of a traditional market: a fake market. However, you can escape the camera-wielding crowd by wandering to the meat, fish and poultry section, where most people don’t venture because the sights, sounds and smells aren’t so attractive. The hot food section is also wonderful. Even though it’s under the full gaze of dozens of camera lenses, most people stop short of sitting down at one of the wooden benches and ordering one of the steaming, hearty bowls of soup. But do this and you’ll actually be partaking in this real, live market, not just spectating. The food is excellent and cheap, and you’re likely to be invited by fellow diners to toke on their bamboo pipes and shoot back their rice liquor. In general, I don’t feel comfortable at Bắc Hà Sunday market. I like it and loath it. After all, I am one of the hundreds of camera lenses at this market (the photos in this article are proof of that). I didn’t buy any red chillies from the minority woman I offended, and I was tempted to purchase one of the souvenir trinkets from the ‘Kinh’ stalls. Like most tourists, I don’t like to think of myself as a tourist, but Bắc Hà market reminds me that I am. It would be nice if more tour companies employed local minority people as guides around the market. This would produce a few jobs for local people and it would encourage foreigner-minority interaction through translations provided by the local guides. To see the market at its best, get here before 9am. To give something back to the market and the people who make it happen, buy some of the exotic fruit on offer, try some of the local liquor, wolf down a bowl of the local soup, and ask before taking a photo. This entry was posted in ALL, Cultural, DESTINATIONS, Mountains, The North, The Northwest and tagged bac ha, ethnic minority, guide, market, northwest, sapa, sunday, travel, Vietnam. Bookmark the permalink. Hey Tom, my. Name’s also Tom. Too many of us hahaha. I’m in Bac Ha right now. I followed your recommended ride from Sapa towards Ha Ziang and stopped in Bac Ha to sleep. Booked a hotel at what seems to be a crossroads. There is a lot of military presence here. Also until 7pm they were blaring what sounds like military talk radio, but I honestly dont speak Vietnamese and dont know. There have been what look like drunk teenagers riding around the square and I hear screams of a woman. Almost made me go down but the family who owns the hotel just keep doing there thing as if nothings going on, so I’m taking it as a quie not to get involved. Kind of ominous vibe. Just a very different experience than staying in the Ta Phin village. Not really interested in coming back for the Sunday market, especially it’s inauthentic. Wanna be real if you know what I mean. Off to Ha Ziang tomorrow. Let me know if there’s a hostel you would recommend to meet other travelers. Thanks for the info. It’s been a big help with creating this journey I’m on. I see. Doesn’t sound like a great experience. 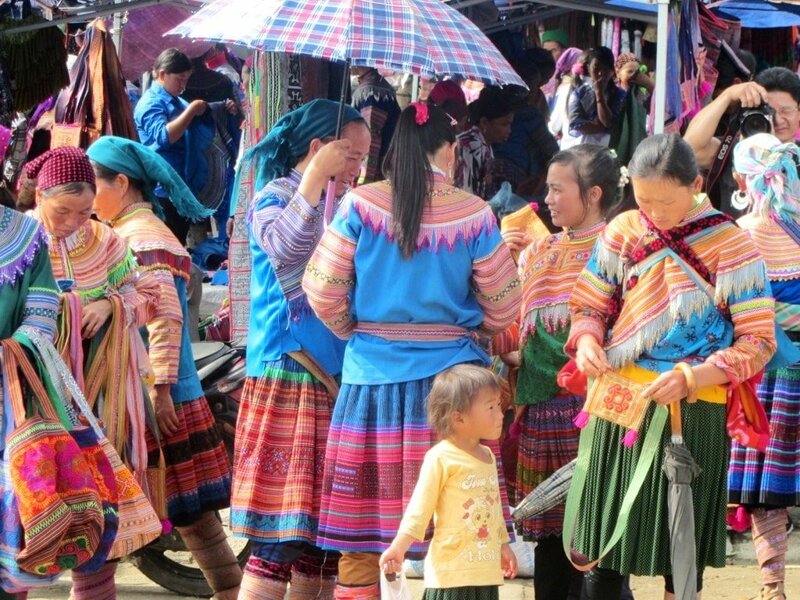 And if you don’t like ‘touristy’ stuff then it’s probably best to give the Sunday Market in Bac Ha a miss, because it is very crowded these days. For suggestions of good accommodation in Ha Giang take a look at the first couple of paragraphs of Section 1 of this guide. There are plenty of social hostels in Ha Giang now, such as Bong Hostel. Yeah it was really just a rainy day in Bac Ha, and I had a little bit if an off experience there. The market still may be very well worthwhile. And I’ve really enjoyed travelling through Ha Ziang. It’s a beautiful place with really kind people. I’m visiting Vietnam for the first time in less than a month and your site has been invaluable in helping me plan my trip. Thank you! I am hoping to visit the Sapa region in early October and was wondering if there are any good, budget friendly motorbike riders I can contact to help me do the Sapa-Sin Ho loop? I don’t ride myself, but this seems like an incredibly beautiful (and non touristy) stretch that I shouldn’t miss. Yes, it’s a great little ride. I don’t know anyone specifically. But maybe you could try contacting Sapa O’Chau and seeing if they can either arrange something or suggest someone. People who don’t want to ride themselves usually take an Easy Rider (Google it), but I don’t know if they have a presence in Sapa or not. I hope you find someone to take you. What an amazing weekend Market. I very much love the local and scenery around Bac Ha town. I did visit Can cau market on Saturday and stayed 1 night in Bac Ha town. Sat at road side cafe bar and had few beers! It was life. Really appreciated the detailed and nuanced account of your visit to Bac Ha. 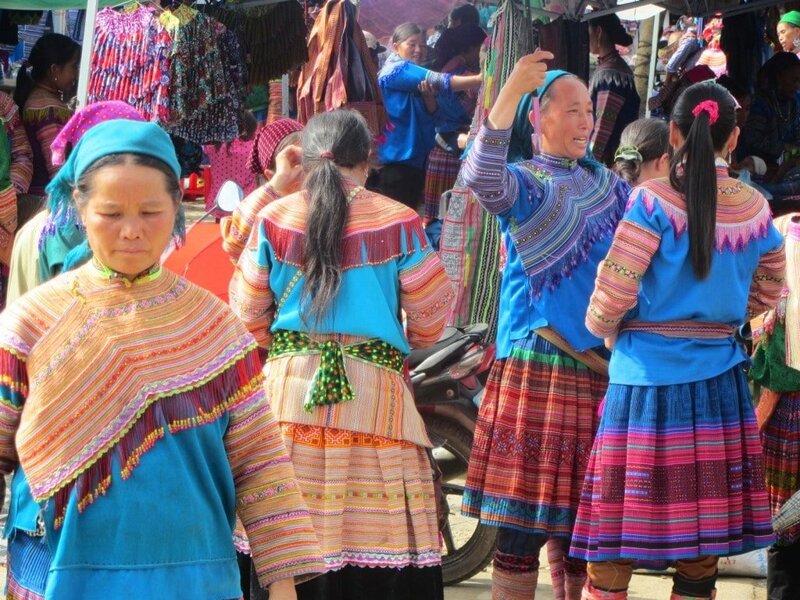 I will visit that part of Vietnam soon and was hoping to plunge into the photographer paradise that is Bac Ha market but was really reluctant in participating in a circus show, especially if it’s to the detriment of local tribes. Yes, it is a bit of a circus, especially when it comes to photography. You could try visiting other small towns in the area on a Sunday instead – Sin Ho for example, or the towns on the Borders and Back-Roads loop. 🙂 Yes, I know what you mean. There are, as you say, still plenty of minority markets in Vietnam that don’t receive that same amount of tourist attention as Bắc Hà. I hope these markets continue to thrive.